The moves, including the promotions of two female execs, come after Doug Ketterer's retirement. Morgan Stanley Wealth Management is restructuring its leadership after Doug Ketterer, who led strategy and client management, retired last week. Among those executives being promoted are two senior managers: Sara Furber and Shelley O’Connor. According to a memo released by Greg Fleming, who heads the unit’s 16,076 financial advisors, Sara Furber will now be head of Corporate & Institutional Wealth Management and Wealth Management Strategy. “These organizational changes will enhance our growth strategy, further align our businesses, and promote the development of a specialized value proposition for each of our clients,” Fleming said. The units under Furber’s supervision include Corporate Equity Solutions (stock and retirement plans), Graystone, Government Entities and Corporate Cash. “Graystone will also continue to be part of the Consulting Group and dual report in to Jim Tracy,” according to Fleming. Furber also will be in charge of the company’s digital platforms, mass-affluent segment (including the Client Advisory Center) and strategic lead management. In addition, she will continue to overseeing risk management for the wealth unit. “Chris Randazzo, Chief Information Officer of Wealth Management and Investment Management, will continue to work closely with Sara across all of these businesses, given the large dependency on technology and the leadership he has exhibited with Corporate Equity Solutions,” Fleming explained. Adam Kudelka, who has been head of human resources for Wealth Management, will succeed Sara as the group’s chief operating officer. Kudelka’s role entails coordination across Wealth Management and oversight of technology and operations activities. Larry Frers, currently leading human resources for Field Management will assume Kudelka’s prior post. Shelley O’Connor, head of field management, is now in charge of International Wealth Management, Global Sports and Entertainment, the Client Development Group and Private Wealth Management. She has been given the title of vice chairperson. Average assets per Morgan Stanley advisor were $126 million as of Dec. 31, and advisors had average quarterly fees and commissions of $944,000 in Q4’14. The number of reps at Morgan Stanley dropped to 16,076 in Q4’14, down from 16,162 in Q3’14 and 16,456 in Q4’13. Over the past few weeks, Wells Fargo Advisors (WFC) said it recruited five reps from the rival wirehouse, which is led by James Gorman. 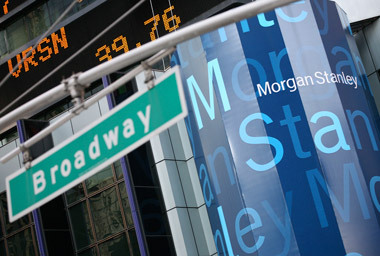 On Monday, Bloomberg reported that Morgan Stanley leaders received performance-based stock that have more than doubled in value being granted three years ago. Gorman, for instance, received 113,510 shares, which were valued at $4.1 million on Monday, up from $1.94 million in 2011.